There is no country on Earth that takes its racing as seriously as Italy. In recent years, it has produced tiny sporting machines for an enthusiastic clientele, built regardless of cost, that feature all the high-tech ingredients of the most sophisticated superbikes. From the late 1950s, Italy exported the most coveted 50cc machines directly derived from racing practice all over Europe. These were not pedal-assisted cyclemotors but racing bikes in miniature, sharp as a tack and endowed with astonishing performance. But more restrictive legislation drove these pretty little machines off the road. It is only now that a new generation of road-going 50cc sportsters is appearing, with Gilera as its standard. 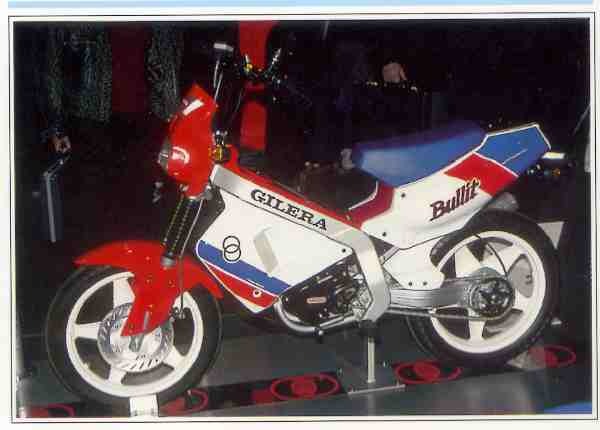 The Bullit, launched at the Italian shows in 1989, is a bizarre styling compromise. Its basic form seems derived from utility cyclemotors, with a semi-open frame and no apparent fuel tank. In contrast, all the elements that make it up employ the latest track-derived technologies: a Delta box frame with twin large-section steel backbones painted to look like aluminum, an enormous rear suspension arm linked to a single damper beneath the saddle, high-level exhaust, three-spoke alloy wheels, large-section tires and an aggressive color scheme. No item of equipment is missing from the Bullit's specifications – it even boasts an enormous ventilated front disc 9 1/2 inches in diameter! The unmatched creativity of the Italians has created the Ferrari of the cyclemotor world in the Gilera Bullit.